If you have a large area to cover and are looking for a low maintenance option for your butterfly garden, then natives are the way to go. The list below is for Missouri natives. If you’re not sure whether a plant is a native or not, there’s a complete list at the bottom of the page. GrowNative.org has a nice list on their website. Grow Native Resource Guide is available to download or view online. Anaphalis margaritacea Pearly Everlasting HP Painted and American Lady Excellent host plant in spring+ pretty flowers in the fall. I’ve had this die out the last couple of years. Aristolochia Durior Pipevine HP Pipevine Swallowtail Needs something to climb on. I grow mine in a large pot. Asclepias Incarnata Swamp Milkweed HNP Monarch Will grow under most any condition. Asclepias purpurescens Slow Grower. My plant in a pot with half day sun is MUCH better than the one I put in the soil and more sun. Asclepias sullivantii Prairie Milkweed HN Monarch It supposedly is less aggressive than common milkweed. Asclepias syriaca – Common Milkweed.. HNP Monarch In the home garden with good soil, it is too invasive. It will grow in a large pot, but it will try to escape out the drain hole. Asclepias Tuberosa – Butterfly Weed HNP Monarch Great plant ! Asimina triloba Paw Paw Tree HP Zebra Swallowtail This will spread. Aster – New England HNP Pearl Crescent The best fall nectar plant. There are different varieties. My butterflies prefer the purplish flower to others. Ceanothus americanus New Jersey Tea HNP Spring Azure lays eggs on the unopened flower buds + the Mottled Dusky wing uses it as a host plant. Celtis occidentalis Hackberry Tree HP Hackberry, Question mark, Snout, Mourning Cloak 2006-Snout laying eggs on this. Chamaecrista fasciculata Partridge Pea HA Little Yellow + Cloudless Sulphur It will reseed itself. Echinacea – all varities Purple Coneflower NP The birds also like the seeds in the fall. does well in shade. Eupatorium coelestinum Wild Ageratum NA Reseeds itself – with a little help. Eupatorium serotinum NP Too tall and gangly for my garden..
Glandularia canadensis Rose Verbena NP A good nectar plant for smallbutterflies. but it keeps dying out over the winter. Heliopsis helianthoides Oxeye Sunflower HP Can easily get 5 foot tall.Trim as necessary. Goldfinch eat these flowers. Liatris aspera Rough Blazing Star NP A good fall bloomer. Birds may eat your seed. Liatris ligulistylis Meadow Blazingstar NP Slow Grower. Liatris pycnostachya Prairie Blazingstar NP Tall and needs support. Pretty good. Liatris scariosa Eastern Blazing Star NP Excellent September bloomer. Monarchs love it. Liatris spicata Blazing Star NP Not my favorite. Lindera benzoin Spicebush HP Spicebush Swallowtail Look for folded over or cut leaves…the caterpillar is inside. Lonicera N, H It’s in the garden more for hummingbirds than butterflies. host for Clearwing HB. Pycnanthemum tenuifolium Slender Mountain Mint NP Blooms most of the summer. Verbena – some are perennials NA Buckeye – maybe. Veronicastrum Virginicum Culver’s Root – NP 6 foot and invasive. There is a new program in the U.S. called Million Pollinator Gardens. The idea is to create one million garden habitats for butterflies, bees and any other insects which need flowers to pollinate. Once you create your garden you can post that information online. It’s interesting that the greater St. Louis area seems to be leading the way with 1450 gardens registered as of this posting. You can register your pollinator garden at this site. Please also don’t forget to add Host plants for all the butterflies. One of the cheapest ways to buy trees and bushes is to order from the Missouri Department of Conservation Department. Prices run from $.16 to $.80 per seedling. You can start ordering on November 1st. While the prices are inexpensive, most times you have to buy ten to twenty-five at a time. This would be a great project for a garden club or get together with your neighbors and share a bundle of trees/bushes. 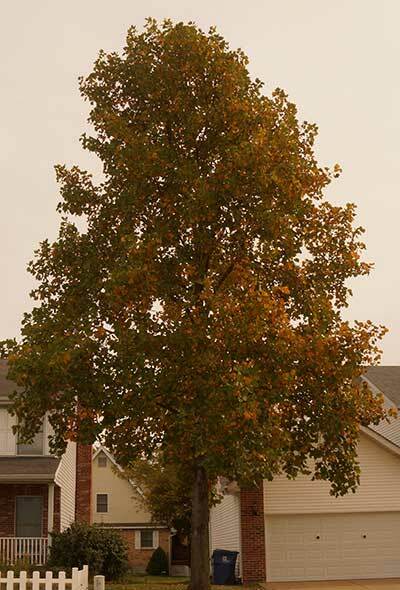 The pictured tree is a Tulip Poplar which is a host plant for the Tiger Swallowtail.